French jeweler Mauboussin will launch two new fragrances for women, à la Folie and Lovely à la Folie, this month. Both fragrances were developed by perfumers Delphine Lebeau and Benoist Lapouza. 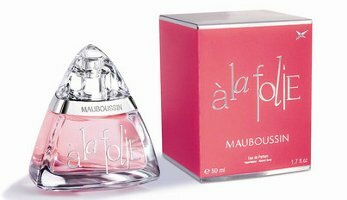 à la Folie (shown) ~ "With this new fragrance, ensconced in a bottle with diamond facets, MAUBOUSSIN breaks out Happiness, with a whiff of intoxication and carefreeness. Eat the last piece of cake, Laugh out loud, Declare your love, Dare to do it, Relax.... A hymn to Joy, Good Humour and Wishes, MAUBOUSSIN is about love itself: ‘à la Folie’." Notes for the floriental fragrance include raspberry, champagne accord, rose and caramel gourmand. Lovely à la Folie (same bottle in paler pink) ~ "A wave of lightness and happiness, Lovely à la Folie means the sweet ebullience of life… A sparkly citrusy-fruity eau de parfum that, ‘à la folie’, blends the freshness of tangy fruits with a gourmand musky base." Notes include lemon, candy apple, rose and white musk. Mauboussin à la Folie and Lovely à la Folie will be available in 30, 50 and 100 ml Eau de Parfum. I still have to try the original M, I have heard so many good things about it! The à la Folie ones do NOT get my interest though. Guessing they’re sweeter than I like, but who knows. I’m with you, Omega. These fumes might be well done but the vibe of the marketing makes them sound too silly for an old broad like me. I have a feeling they’re geared pretty young. I had a bottle of the original, but I just didn’t like it enough and sold it on eBay. I LOVED the bottle however. It was very heavy, sat beautifully on the shelf, and felt good to hold. I have the original and I really like it – and the bottle is gorgeous. These new ones sound a little lightweight for me – aiming younger ( a lot younger) I imagine.